Hickock Bookbinders’ Machinery: Bookbinders’ Tools. Catalogue No. 88. The W. O. Hickock Manufacturing Company, Harrisburg, Pennsylvania, U.S.A. c. 1920. Courtesy of Gary Roberts, who runs the website, toolemera, which has many other fascinating trade catalogs, mainly woodworking, he has scanned. A while ago, I wrote a post about blank book hammers, rounding hammers and backing hammers. Both Tom Conroy and Gary Robberts felt certain that nomenclature was basically for marketing purposes, and they are most likely correct. 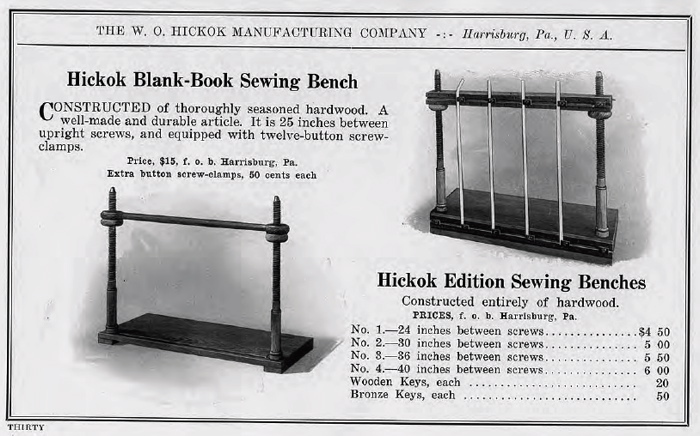 However, when looking at sewing frames, in this case from Hickock, it is clear from the function that blank book sewing frames and edition sewing frames are two different animals. The blank book sewing frames only come in one size, 25 inches, and it appears they have something similar to ‘t-slots’ to hold the sewing tapes secure. Edition sewing frames, with keys, can be used for cords, tapes, thongs, etc. 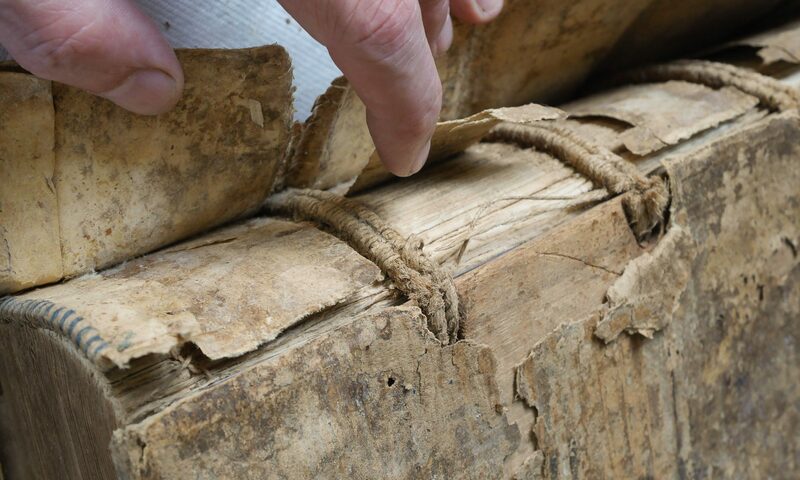 But blank books, at least in this time period, were almost always sewn on tapes. The design looks like it would be easy to get the proper tension on the tapes. These frames must be quite rare, and I wonder if the high initial cost–almost 4 times a similar size edition sewing frame– made them an anomaly, if they didn’t work well, if the depression killed the market, if many of them were trashed when the blank book market disappeared or if it is some combination of all of these. Below is a closeup of the ‘button-screw clamp’. It looks to be an easy way to quickly adjust tension and change tapes. Although I had never seen one of these until reading the above catalog, there was one for sale on the internet, which sold earlier in the same week before I found it. The one that got away. From what I have seen, they are definitely more scarce than the typical “edition” frame. I was lucky enough to come across two different, but very similar versions, a couple years apart. I picked up both when I had the chance. My first is identical to the Hickok Catalog No. 88 that you pictured above, while the second I believe is a bit earlier, with more decorative screws and a second set of ‘nuts’ that tighten down from above the cross-beam. The ‘nuts’ on, what I suspect is, the older press are also more decorative as all four have small ‘handles’ that are turned out of the sides allowing you to get a good grip for adjusting. Different for sure. I’ve found that they work just as well with cords as they do with tapes. No fiddling with keys, etc. Each of my ‘Blank-Book’ frames also have a lip on the front of the frame so that they could catch the edge of the work bench and be held more securely in place, although I think that this may have been solely a design consideration to accommodate the additional space needed for the brass runners and keys. Love ’em. I’m jealous! I’d be happy to post a picture of the earlier one if you want to send one. Some years ago I came upon a massive laying press at brimfield. It was on the order of 4 feet in length and made by L. Kennedy, Hartford (the famous planemaking firm). It was too huge for me to consider taking home, but I wanted to. Now I wonder if this was made for the blank book trade? I’ve always heard the really big ones referred to as presses for gilding. The sewing frame is only 25 inches, so I would guess maybe for binders dealing with newspapers? Possibly, but if you allow for some extra space at each end of the press, you only have a foot or less of wiggle room. Then there’s the length needed for the screws. But until some hard information turns up… or I find an L. Kennedy price list that includes bookbinders tools, who knows? I have two in my house right now, both the property of Capricornus School of Bookbinding and Conservation (i.e. Anne Kahle). One has the downward lip broken off; I have to glue it back into place one of these days. Neither has the “screw-buttons,” if I remember correctly, and the lack of these a limit on their usefulness. These are the only ones I have ever seen, though. I don’t have a source to hand for account book sizes, but I am pretty sure that most were 19″ x 13″ or smaller; this would correlate to an efficient use of 19″ x 26″ or 38″ x 26″ paper and board. “Letterpress” sewing frames with larger sizes might be used for atlases or newspapers; they might, though, be used with a sewing technique where the left arm passes between the left post and the book rather than around the left post. This requires a large frame, and still contorts the body into awkward and back-straining positions; but the technique has been preferred by some excellent binders.